Learn Python, Break Python is a hands-on introduction to the Python programming language, written for people who have no experience with programming whatsoever. Hey, we all have to start somewhere. As such, the examples and teaching style used in this text make absolutely no expectations about your prior programming experience. If you've never used a programming language before, leaping into Python might seem a bit scary at first. You don't need to worry. Learning how to program a computer is far from impossible. Anyone can pick up the art of programming with a little time and a bit of patience. However, when learning something new, I try to break things. In fact, in many cases, I go out of my way to break stuff. When picking up a new concept like computer programming, you can actually increase your comfort level by figuring out the type of cases that are likely to break. You'll see what data can be used and where, and when you inevitably run into errors later (like everyone does), you won't be surprised. The idea that breaking things can actually help you become a better programmer is a central idea in this book, and I hope that you take full advantage. I've broken a lot of code in my day, whether intentionally or not, and I think that it's given me the knowledge to help teach other people how to write good code. 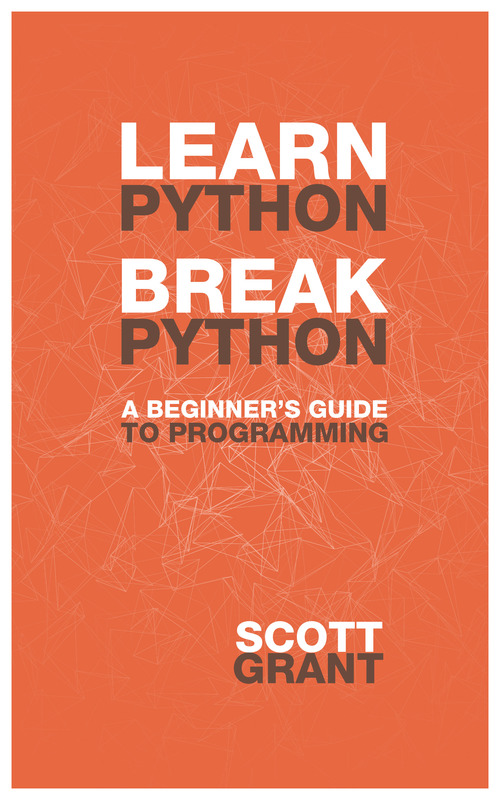 Learn Python, Break Python starts with a gentle introduction to programming. Slowly, through examples and exercises, we build up to a level of comfort by introducing more complicated program elements, and show where they can be used and how we can break them. By building up knowledge in this way, we hope to impart a level of comfort that will make you comfortable trying new things and taking risks; in short, we want you to be comfortable with programming.